Heat 1cm of oil in pan and fry off wraps 1 at a time until crispy. Set aside and drain excess oil on paper towel. Remove most of the oil, reserving about 1 tbsp and heat over a medium heat in a large non-stick frypan. Add in the onion and garlic and cook, stirring for 1-2 minutes, or until the onion has softened and turned slightly brown. Add in tomatoes, KEEN’s chilli powder and sugar, simmer until sauce begins to thicken slightly. Add in beans and a pinch of salt and warm through just prior to serving. 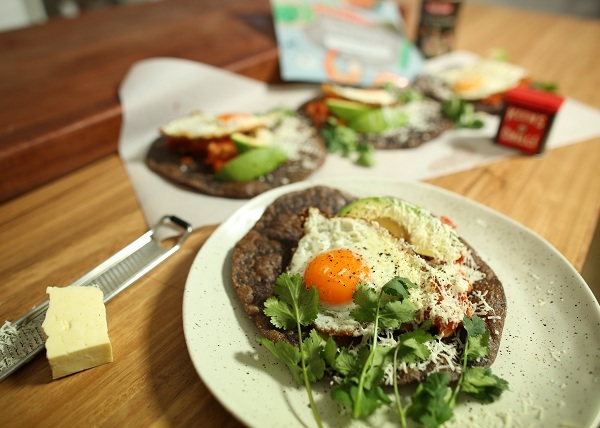 Spoon bean mixture over fried wraps and garnish with eggs, avocado, halloumi and coriander.